The Finished Top Booties are the same great material as our Standard Booties which is the best for running on snow! The difference is in the sewing, finished surged tops and seams to prevent unraveling making them much more reusable friendly. 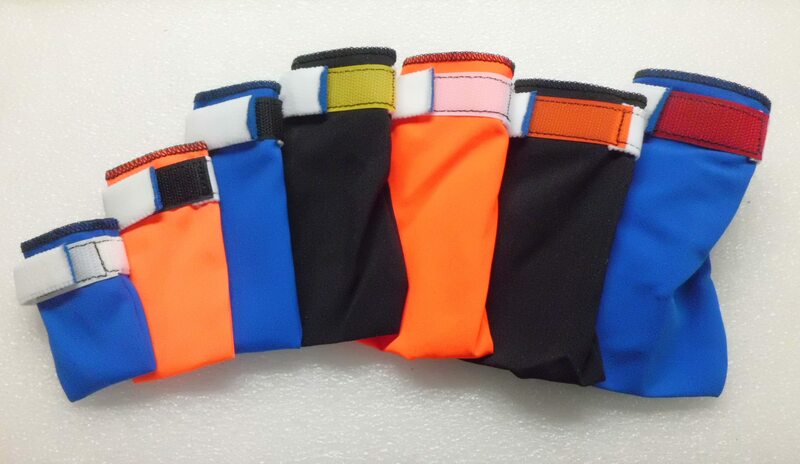 Colors available are Royal Blue, Black or Bright Orange see options to choose your preference. Quantity discounts are shown below and calculated at checkout. These booties have been a lifesaver for my two golden retrievers this winter. Before when I took them into the mountains to snowshoe or ski with me they would get snow and ice buildup on their paws, even if I smeared them with Musher's Secret or Vaseline. And the expensive dog boots I tried would not stay on. While visiting Alaska this summer I learned about sled dog booties. When I got home I did a search and found this site and ordered booties for both my dogs. The booties completely solve the problem! They stay on, protect their paws, and my dogs don't mind them one bit. Winter recreation suddenly got a whole lot more fun for all three of us. Thank you! Absolutely love these booties for my Australian shepherd. Keeps the snow and ice from sticking to his paws. These boots stay on extremely well, even in deep snow. No other boots worked nearly as well. Other pet-store variety boots seem to be designed for humans and fly off almost immediately due to thick, heavy, rubber shoe-like soles, socks and other silly things. These boots don't look fancy, but do their job very well. They actually look great when our dog wears them. Finally, our dog actually seems to like wearing them once he figured out that they saved his feet from ice-ball torture. Been a couple years since I brought my last set of boots, but we have wore some out, lost some . and my pup is not a pup anymore and needs bigger boots !. I have a German Shepherd / Golden Retriever mix and she has the long fur between the toes that builds up snow marbles between her toes when we are out snow shoeing , She is glad to get the boots on , she must know she wont have to keep cleaning out her paws on our hikes !! !